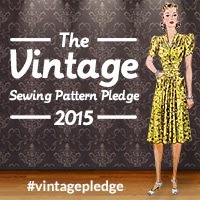 Join the 2015 Vintage Sewing Pattern Pledge! Back by popular demand, the Vintage Sewing Pattern Pledge has returned for a second year! For those of you who don't know, it all started last year when I realised I've been buying vintage and reproduction sewing patterns faster than I can sew them, so I pledged to use at least five of them during 2014. I invited you all to join me on a whim and was overwhelmed with the response - over 100 of you took the pledge and we sewed up almost 200 makes between us! You can admire all of the makes on my dedicated Pinterest board. This year the Vintage Sewing Pattern Pledge is going to be even bigger and better, mainly because I have a co-host! The wonderful Kerry of Kestrel Makes and I will be working tirelessly to bring you monthly inspiration posts through the decades, insights into fellow stitchers' vintage pattern stashes, giveaways and discounts, round-ups of your makes, and final prizes. Exciting stuff, no!?! Whether you're taking part in the pledge or not, if you have an enviable or eclectic vintage sewing pattern collection we'd love to hear from you! You could be one of our montly interviewees! Use your first ever vintage sewing pattern. Sew up a specific pattern from your stash. Explore patterns from a particular decade. Have fun patterns from a certain range of decades. Get creative with you vintage sewing patterns! During 2015, I, Marie Koupparis, will sew up at least five of my vintage or reproduction sewing patterns. 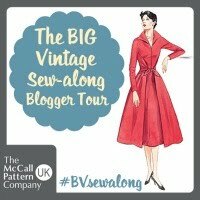 Tagging them with #vintagepledge on Twitter (@StitchOdyssey or @kestrelmakes) and Pinterest. Leaving comments on mine or Kerry's blog. Dropping me (astitchingodyssey[at]hotmail[dot]co[dot]uk) or Kerry (kerry[at]kestrelmakes[dot]com) an email. So, what are you waiting for? Grab a button (beautifully designed by my boyfriend again) and start spreading the word! I'm in again! But this time I'm going to make up all 5 rater than the 4 I managed in the end! I, Joanne of SewLittleTime, will sew up and blog at least 5 vintage patterns in 2015. I, Sophie from SophieLovesSewing, will discover at least 1 vintage pattern I love and make it up in 2015. I, Angelica of My Dear Lizzie, will sew up and blog at least 3 vintage patterns in 2015. Of the 3 makes, at least one must be from my vintage Lutterloh collection. I am in for sure. I have loads of "true" vintage patterns, vintage repros and copies of Victorian and Edwardian patterns from companies that find and reissue then. I also have some precious (to me) plus-size vintage patterns so could make something that actually fits me. Quick question though, I have some books which have historical/vintage garments from museum collections sketched out as small drawings. If I were to translate that into a pattern does it count? I Louise from Seams Odd Louise, will sew up at least three vintage patterns in 2015. So excited going to go through my stash right now! Even though I am co-hosting, I'd better make it official by pledging here! During 2015, I, Kerry of Kestrel Makes will sew up at least four of my vintage sewing patterns. Of course I'm in again! During 2015, I, Lauriana from petitmainsauvage will sew up at least five of my vintage sewing patterns. And again, I will try and pick these to explore new-to-me eras in fashion. I have no idea what I will sew but I will sew something from my collection... is that pledge enough? During 2015, I, Jennifer Patience, will sew up at least three of my vintage or reproduction sewing patterns. I'm up for it again and have two patterns on my cutting table already! Thanks for hosting. I, Sue, from Fadanista, will make a vintage pattern every month, and will attempt to resize one really difficult pattern. I'm in again! I, Bobbi of the Bobbilicious Files, pledge to sew at least three vintage patterns. I'm Nathalie from nathaliesews and in 2015 I will use my first vintage (or reproduction) sewing pattern. Has anyone tips on where to find nice vintage sewing patterns that are not to expensive? I'm in! I will make at least three vintage patterns from my collection...one from the 50s, one from the 60s, and one from the 70s. I'm gong to go for it and sign up for my first ever sewing pledge! I, Joyce from The Story Sew Far, pledge to sew 3 vintage patterns in 2015. There, I've done it now...gulp! I'm going to join in! I've picked up a few vintages patterns in the past year and one of my sewing resolutions is to give them a go. Grabbing the button and adding to my blog, The Stylish Stitcher. Going to aim for 3 patterns! During 2015, I, Catherine Turney, will sew up at least three vintage sewing patterns. I found out about this too late last year, but this year I am totally in!!! Super excited!!! I, Tasha of By Gum, By Golly, pledge that I'll sew at least 5 vintage patterns this year. Yay! I hope this will push me to sew some of the patterns that have been lingering on my sewing list. I, Tanya Hughes, will sew at least six of my vintage or reproduction patterns this year and actually remember to hashtag and send them in! Brilliant idea, so much more fun then sewing on your own. However, reading all the pledges I feel I need a sewing name so will have a good think over the weekend. During 2015, I, Maria F-P will sew up at least five of my vintage or reproduction sewing patterns. I'm doing this! I, Kacy Burchfield, of She's Sew Bettie, will sew up at least five of my vintage or reproduction sewing patterns this year! I, Natalie Clarke, will use at least 5 vintage patterns that I haven't used before, from my current stash. I'm in! I was bummed I missed it last year! I have 2 vintage patterns and a couple of reproductions. During 2015, I, Kathy Nguyen, will sew up at least three of my vintage or reproduction sewing patterns. Oh, I'm in this year, Marie! I won't have tons of time for sewing this year, but I, Evie, pledge to sew up at least four vintage patterns this year. I, Elle, from threadtension vow to make up all but three of my vintage patterns (the ones I haven't already sewn up, of course) this year. Bonus points for tackling one of the two scary coats! I, Sarah, with no blog (!) 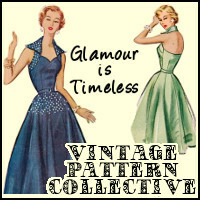 Pledge to make my first vintage pattern. It's a 1961 skirt, blouse and jacket set. Hopefully I'll get to make more, so anything more than this will be a bonus. Marie, I have been following your odyssey in sewing quite som time now and would love to join your pledge. I Aida, from idaaidasewing, pledge to sew 3 of my vintage / reproduction patterns during 2015. I'm in for the first time. I pledge to sew up 2 of my vintage patterns before the end of 2015! Great motivator!! I have loads of vintage patterns (mainly 70s), and I graduate in May which means more time to sew! That said, I want to sew contemporary patterns too so I'll keep my pledge small. I, Alice Charette, pledge to sew up at least three of my vintage and reproduction patterns in 2015. I, Beth Holmes, pledge to make 3 vintage garments in 2015. So exciting! I've only sewn vintage once before so hopefully this will be just the push I need to use more vintage patterns! This is so fun and great to hear Kerry is on board! I missed last year but I'd like to try this year. My goal will be to make something from a vintage or repro pattern from the 40s, 50s, 60s, 70s and 80s. During 2015, I, Susie Woods,, will sew up at least five of my vintage or reproduction sewing patterns. I, Piper Springs, will sew up one of my vintage patterns, no problem, but as a real challenge for me, will photograph and share it! I'm in again! This time I'm going to try and achieve my 5, same as last time. I, Tina Crossgrove, pledge to sew up at least three of my vintage or reproduction patterns in 2015. I will start to sew for me this year (did costumes and clothes for dolls before, but not daily or wearable garments), so I think it would be good for me to join. I, Mayumi Adler, will sew up 5 vintage patterns or reproduction. I'm going to give this a go too. I have a few vintage patterns, so let's say I will make at least 1 item this year. I'm in again this year. I think I'll just keep going on this year with the plans I had for last year that I didn't get done. Brilliant! I spotted this too late last year to join, and was so disappointed - thrilled that you're doing it all again! During 2015, I, Elaine of blacktulipsewing.blogspot.com, will sew up at least three of my vintage sewing patterns. I didn't finish my pledge last year (made a lot though!) but I'm in again, this time with something i absolutely HAVE to finish! I, Allie of missalliemass, will complete my wedding dress, made from a 1963 pattern!! Thanks for running this again. I did not even remotely hit my target last year but I vow to be better this year. I'm going to pledge the same again though, I pledge to make up 4 items from my vintage or reproduction patterns from my stash this year. Thanks for a great challenge! I, Carolyn, from Handmade by Carolyn will sew up five of my vintage patterns this year. I loved watching this last year and would love to be part of the fun this year! So here goes. I, Claire of iwanttobeaturtle, will sew at least 3 vintage or reproduction patterns this year. Time to shop my stash, or Etsy! During 2015, I, Alecia of sewtoneverland.blogspot.com, will sew 5 vintage or vintage reproduction patterns. I'm in! I pledge to make up at least four of my vintage sewing patterns. One per season? I don't have any genuine vintage patterns, but I do have two reproductions, so I'll join you. I, Fiona, will sew one of my sixties repros during 2015. I'm not really good at following other peoples "rules" (however good they are) so this pledge - where I set my own rules - suits me perfect! I, Anne, pledge to sew 3 vintage garments and draft at least one from a vintage pattern book. Oh, yay, I have been waiting for this to come along again. I am a green blogger and really look forward to getting to know everyone. I, Melanie of, The Seamstress Project, pledge to make at least 5 vintage garments from my vintage pattern stash. It will be a marathon hunt for my favourite patterns as my collecting spans over 18 years! My collection spans over 100 years - How do I ever decide...? I'm in! I pledge to make at least one vintage pattern! Keeping it realistic, haha! 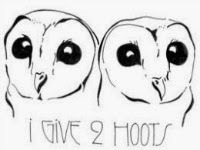 I just found out about this on Black Tulip's blog and this fits one of my goals precisely. I, Laurie, of Teacups in the Garden, to make an outfit from my first vintage pattern from the stash I started to collect a couple of years ago. After failing miserably last year, I am in! In 2015 I pledge to sew at least 6 garments from vintage or reproduction patterns and submit photos. I only found your blog now, I guess I have read about last years pledge somewhere, but having a huge pattern collection I totally would like to join and see what others are doing with their patterns. Therefore I, Doris Colanero, aka Mrs. Button of Mrs. Button's Vintage Corner, will sew up at least five of my vintage sewing patterns this year! I'm totally excited to be in! Just to make things a bit different, I, Julia Croyden, will be knitting at least 2 jumpers from "A Stitch in Time", during 2015. Let's see how that goes. Sounds very reasonable to me! I, Patty from CraftsEverywhere!, pledge to sew at least 2 vintage patterns (from the 1970s) and knit at least 1 pattern from "A Stitch in time"
Yes, yes, yes! I'm in! I'm always sewing vintage patterns for others so it's my chance to sew for myself. I'm a pattern collector (hoarder?) and have lots that I've bought for myself, but customer makes have always had priority. So I, Deli aka Delphine Delovely, pledge to make 7 outfits from original 40's and 50's patterns in 2015. I have put sewing up some vintage patterns as one of my sewing resolutions so I have to get involved in this - I have two 1940's beauties to start with already and a stash of mainly 70's patterns from my mum to try. So yes I am in! I, Sarah at Sewing Beautifully, pledge to make 4 vintage patterns in 2015. I, Aja, pledge to sew two patterns from my vintage stash during 2015. Oh yes please can I join in too! I heard about this far too late last year to take part, but I did in fact make my first ever garment (blouse) from a vintage pattern in November last year and I'm really pleased with it - just need the weather to get warmer so I can wear it! I've recently discovered vintage patterns and have collected far more than I will ever be able to make up in my lifetime! I've realised that I'm totally drawn to cute little 1950's style tops, full skirted 1950's style dresses, asymetric details and pleats on bums! Here goes! During 2015, I, Sonja, pledge to sew one vintage pattern. Eek!!! 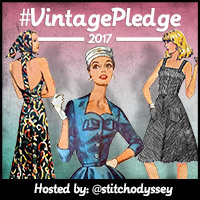 I'm going to take the vintage pledge this year since my sewing has been leaning that way. Going to pledge to sew 3 up, but maybe not the that are already in my stash. Excuse me while I go buy some more patterns. HI THERE! I am in ! I pledge to sew at least 3 awesome outfits in 2015! well for now I'll say one & go from there, surely I can put one togetherr lol! As I have a sizable collection of 1970's patterns that I really need to work through, I'm going to join in this year. I, Nikki, pledge to sew 4 vintage patterns during 2015. I, Dee will make at least one vintage outfit using a vintage pattern this year. I, Linda, of Nice dress! Thanks, I made it!! Pledge to make up at least ONE of the vintage patterns that was given to me by my sister - she gave me two small boxes full... So gee! It's about time! I'm in! I, Sarah, of Honey Hi Stitches pledge to make up at least five vintage sewing patterns this year. I'm so glad I found your blog in time to join in this pledge! I've collected so many patterns that I used to wear/make back in the 60s and 70s, and I'd love to re-make some of them. I pledge to make garments from at least 4 vintage patterns in 2015. I am so in this year. My stash has gotten unrelenting. This year, I, Katryna of Boots & Cats, pledge to make at least 3 garments using vintage sewing patterns! It's on! I'm pledging to make another 5 vintage patterns this year, and finish off the ones from last year I still want to finish! And to make them up in stash fabric. I'm really looking forwards to taking part this year, so during 2015 I, HazWool, will sew up at least five of my vintage or reproduction sewing patterns. I'm super excited about this year's #vintagepledge and have a loft 7 pattern goal. Thanks for hosting this event. Can't wait to get started. I, Jenna of justsewjenna, pledge to sew 3 items from my vintage patterns and knit 2 in 2015. Excited!! I'm going to play too. Hopefully I'll actually finish some this year. Thank you for hosting! I, Nayla of naylasnotions, pledge to sew 4 garments from vintage or reproduction patterns within the year 2015. Oh man, I am excited for this! I Carla of Tiny Angry Crafts, pledge to sew at least seven of my vintage patterns, and knit one in 2015 ! I peeked in from the sidelines last year completely in awe of the talent I saw. So I'm gonna get myself organised and pledge to make five vintage dress patterns and a few knitted items to kick start the vintage wardrobe I've always dreamed of. I recently found two shoe boxes completely filled with vintage patterns from the 40's through the 70's from my mom's family so I'm really excited about this challenge! I pledge to try out my first vintage pattern in 2015 and then depending on how that goes I might set a goal of sewing 3. I'm thinking about starting with a pattern for a beach cover-up and one for a lightweight hooded jacket. Also, really thrilled to have found your lovely blog! I'm in again this year! So glad you are hosting it again. I, Alice, will see up at least 3 of my vintage or reproduction patterns in 2015! How old is vintage? I thought the generally accepted definition was 50 years old but I see in the comments that people are referring to patterns of a more recent date. I want to join the Pledge but the number of garments that I pledge depends upon the definition as i have a limited number dated from before 1955. I'm in! I Helen Made will sew at least 5 vintage patterns from my current collection. Oh, I want in! I have these 1930s-1940s German-language sewing magazines my aunt very generously gave to me, some of which still contain the patterns... I, Hana - Marmota, pledge to make at least one of those patterns in 2015, even if it's something as small as a pair of mittens! I, Sara of Gladys + Viv, pledge to make up five vintage or reproduction patterns that I have not sewn before. I'm in! I need to justify my growing collection! I Alex, of Beulah Birtley, pledge to sew up at least 3 vintage or reproduction patterns in 2015. Can't wait to see what everyone makes! You have inspired me! I've bought 5 1960's patterns from Ebay and already made one muslin (several adjustments required!). I Elleray Girl, pledge to make at least one of those patterns in 2015. During 2015, I, Kirsty of Tea And Rainbows, will sew up at least three of my vintage sewing patterns! Late to the party, but I, Andi Satterlund, pledge to make at least 2 of my vintage or vintage repro patterns. It's not a big number, but I don't sew very often! And can we play on instagram too please?? same #vintagepledge ? Count me in! And that Simplicity 2781 has to be the most divine dress ever!! I'll pledge to start with a DVF wrap & finish my poor neglected McCalls 6470 (hmm… lets not put her in writing… ;) ) - I am planning on counting the 70's as vintage!! ok, I pledge for 5 and for my own personal bonus points, I'll aim for one from the 30's, 40's, 50's, 60's & 70's… by May 2015. By the end of this year, I will have completed 3 and made plans for the remainder. I pledge to make at least 1 fun vintage outfit this year! Love this, I'm so bad at letting my dreams get so much farther ahead of me than the reality! I, Stephanie of Aux Belles Choses, pledge to make 5 of my repro patterns in 2015. I loved the vintage pattern plegge last year, this year I want in too. I'm in this year. I only have 1 real proper vintage pattern and this is the year it's going to get sewn. I, Alison of boomstitch, will make my vintage shirtdress. I'm in, I managed one last year so I can definitely do at least one this year, if not more. This year I want to make my first "real" vintage pattern - not just one of the re-issues. 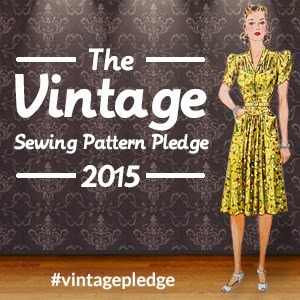 Count me in too....I, Liza of http://www.thevintageknitter.blogspot.co.uk/ will pledge to sew a minimum of three vintage patterns in 2015. Thanks for arranging this - it looks like fun! I'd better start deciding on what to sew! I, Emma of Ivy Black Chat ( and Vintage Stitches) will sew up and blog at least 5 vintage patterns in 2015. Hurrah! During 2015, I, Charlotte, will sew up at least two vintage or reproduction sewing patterns. This is a great incentive to actually use one of my vintge patterns! I, Nicole of A Little Fabricated, will sew up at least 3 vintage patterns this year (one of them might be children's). I, Erin of F is for flamingo pledge to sew at least one vintage pattern in 2015. I have never used a vintage pattern although I have some nice 1950s ones in stock. I would love to take part! I, Caroline, of Caroline Paradigm Design pledge to sew at least one vintage pattern in 2015. In 2015 I, Megan, will sew up at least two (I know it's small but I don't want to pressure myself haha) vintage sewing patterns. This is gonna be great and such a motivator. it's hard not be focused on all the indie goodness out there. I've never used a vintage pattern before but have wanted to for a while, so this'll be a good incentive for me but I'll keep my pledge simple to start with! I, Ruth of Nightingale & Dolittle, pledge to sew at least one vintage pattern in 2015. I'm joining again this year! And at the beginning of the year, unlike 2014! No excuses this time. I, Karen of Bobbins and Bombshells, pledge to sew 5 vintage patterns in 2015. Thank you for doing this. I'm in! Ooh! Count me in! I have soooo many. I need to quit my job and just sew... Except how will I pay for the sewing if I quit my job....? OK, I tried to tell myself I didn't want to do this, but I do. I've only ever sewn a reproduction pattern, but I do have one mail-order vintage shirtdress that I've been sitting on. Time to move on that. I, Sarah of root branch bole, will make my first really, truly vintage pattern this year! And if it goes well, I'll make it more than once. I'm in this year! Last year I thought about signing up, but I didn't think I'd realistically sew much that was vintage - but looking back now, I seem to have sewn and blogged about four vintage patterns! I, Gabrielle of Up Sew Late, will sew and blog at least four vintage patterns in 2015. I'll try to choose a mix from my collection of proper old patterns, recent Vogue vintage reproduction patterns, and "retro" patterns, and they'll likely be a mixture of kids and adult patterns. I would love to sew up one vintage pattern from my collection this year, and blog about it at rycrafty.com! I am going to pledge 2 vintage sewing patterns. I, Elizabeth Young, pledge to make 5 vintage garments from vintage patterns in 2015. And to BLOG about each and every one! I serendipitously found out about this on the same day that I bought my first vintage pattern! It'll be my first pledge, too - excited to take part! I, Avrïl of Not Your Bobbin, pledge to make one of the garments from my amazing new vintage pattern, and to blog it. Hope I'm not too late to sign up! I pledge to sew up at least one of my vintage patterns in 2015. I, Jayne of Empireroom, pledge to make 5 vintage outfits from my stash of patterns & fabric (no purchasing allowed) for me & not for a musical I'm designing. I, Lauren of The Recycled Haberdashery, pledge to use at least 1 vintage or reproduction pattern in 2015. I, Tania, pledge that I will make a blouse, skirt, dress, petticoat and an ensemble from my stash of vintage patterns. Thank you for this inspiration . This sounds like fun. I've been wanting to sew up some vintage patterns and have a few pulled from the stash that I want to make. I, Karen pledge to make at least 3 garments from vintage patterns. I, Paula, pledge to make at least two garments from my vintage pattern stash. I have a whole stash of beautiful, treasured vintage patterns which I somehow manage to never use....This may just be the push I need to get started. So, I, Gia, also pledge to make at least 5 items from my vintage patterns in 2015. This is just what I needed to get me refocused on my vintage patterns. I, Gina of pennysewvintage.com, pledge to sew clothing for myself using at least 5 of my vintage patterns. I just made a 1990s dress so I'm in. I, Maria, from cleverthinking99.com, will make five (gulp) vintage patterns in 2015. I, Joanna, pledge to make at least 3 garments from vintage or reproduction patterns in my stash. I, KathyS pledge to make 5 vintage patterns from my stash in 2015. I have already made a top in January from a 1975 Style pattern. I Nothy, pledge to make 5 vintage patterns from my stash. I have tons of vintage patterns so it is just about getting to it for me. I, Gretchen of Part Time Lion Tamer, pledge to sew at least 5 garments / projects from vintage patterns. I also pledge to use vintage fabric for at least one of them! I, Kathleen of Midvale Cottage, pledge to sew at least 3 garments from vintage patterns. Woo hoo! Here goes, I, Caroline of CJ Made plan to sew a vintage garment from my collection of patterns and I will also try to use some of my vintage fabric to make something too! I, Sarah, vintage pattern hoarder extraordinaire, pledge to make at LEAST five garments from my collection and document said process OR I will give five patterns away to charity or the first claimant. I, Laurie of Threadbare Stitches, will make three vintage garments this year, two sewn and one knitted, and stash bust my polka dot vintage fabric! I, Laura Mackenzie-Hawkins, Spinally Challenged Mum of 2, Pledge to make 4 Vintage Patterns from my stash and to use Vintage Fabrics also from my Stash as well as maybe using other fabrics from my stash as long as they suit the style. I do hoard patterns as much as fabrics so maybe this is the push I need to use my vintage collections and put them to good use. My daughter has already chosen a 1970s skirt pattern and a 1960s Vogue 7297 Coat pattern. Can't wait to see the wonder Vintage patterns coming alive in a massive array of Fabrics. I've finished one Anne Adams jumper and blouse and started a slip! Yay! I've already started!! I've just sewed up a vintage Vogue repro pattern, albeit modified with some modern pattern details :). So I'd better add my pledge here instead of just hiding it on my blog, right? During 2015, I, Gabrielle Corbett of www.upsewlate.blogspot.com, will sew up at least four of my vintage (up to and including 1990s) or reproduction sewing patterns. I look forward to checking out the Pinterest boards! I, Laura Stanford, lingerie designer, maker and co-author of The Secrets of Sewing Lingerie will make time for some personal non-lingerie sewing! I have two goals, as it's going to be a busy year... Firstly, I will finish remaking my favourite vintage 1940's dress which sadly went past wearing last year. It now only exists as picked apart pieces, photos and an almost finished draft of a pattern. Secondly, I want to make a Vogue 2241 dress. I want to fit it and then adapt it into something inspired by THAT green dress from Atonement. Which will lead me nicely onto my 2016 #vintagepledge most likely! I, Joy, pledge to sew & share five vintage patterns in 2015. I've joined quite late, so I better get started! During 2015, we, Eleni and Kasi of Threads of History, will sew at least five vintage or reproduction sewing patterns each! I Jen of Hummingbird Sews pledge to sew at least one vintage pattern in 2015. This will be my first attempt at sewing a vintage pattern, I hope to catch the bug and that this will be my first of many! I, Pam of Antipodean Stitcher, pledge to sew at least six (more - I'd already made one) vintage patterns in 2015, AND to use vintage fabrics for at least six projects. Honestly, I have a bunch of vintage patterns and fabrics in my stash that I've yet to use, so hopefully this can be a motivator. Just found out about this and already have used one of my vintage patterns this year! I am in! I,Ami-May of stitchinginsane will buy some vintage patterns ive always wanted to start my vintage pattern stash n pledge and will start sewing vintage which what ive always loved. Im in. 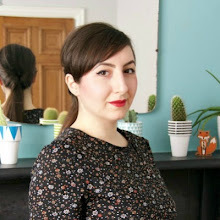 I, Ronnie of NO Blog but have a Burdastyle account http://www.burdastyle.com/profiles/ronnielee don’t need much encouragement for making a vintage sewing pledge. My vast vintage pattern collection, years ranging from (1922 to 1970's) At last count, I've made over 60 garments from vintage patterns. I've been very lucky on my fabric finds also. I have a least 20 patterns I haven't used yet, my pledge will be to make 4 new items with the next few months. I, Emmanuelle of Zoubi Zoubisou, pledge to sew at least five vintage patterns in 2015. Yay! I, Mandy, of Overly Optimistic Crafter, will sew up at least two of my Vintage reproduction patterns in 2015. I, Elie, of attieanddora.com, will use my first vintage sewing pattern in 2015. I was very lucky to be given a box of vintage patterns recently by a good friend, so I really have no excuse now. Very excited to give this a try. I, Sara of harmonythroughimperfection.blogspot.fr, pledge to sew two vintage patterns, and to use at least one of my granma's vintage fabrics in 2015. Fashionably late, I, Siri of http://pinhouseplaymate.blogspot.no/ , pledge to use 5 (or more) vintage patterns from my stash in 2015. Best of luck to all participants! I, Tim (@sewingtim), pledge to make 4 vintage patterns in 2015. These will be for Helen (@saagmum) We are both looking forward to it. I'm super obsessed with 1940s fashion right now thanks to the show Bomb Girls! Very excited about this challenge but nervous too! :) Can't wait to see what you all come up with! I'm shooting for the big 5. I,Sevda,dikiskis.blogspot.com,pledge to sew at least five vintage patterns in 2015. I thought I had signed up for this in January, but apparently my comment got eaten! I, Bonita Vear of Lavender & Twill, pledge to sew up at least five vintage or reproduction vintage patterns in 2015 ~ these MUST be patterns I haven't used before from my stash! What a cool challenge! I Linda Martha pledge to sew 5 vintage garments because 5 is my lucky number. Thanks for keeping membership open ended too! I didn't know about this till today. Awesome challenge. I only just found it. I sewed my first (and second) vintage dresses for my daughter during Spring KCW. I'm still learning to grade patterns so I will keep my pledge small for now. I Logan of https://loganstitches.wordpress.com/ pledge to sew up at least one more (for a total of 3) vintage pattern from my vintage pattern stash in 2015 and to get said stash inventoried and stored properly. I am going to make 5 as well! I have just started sewing from pattern so this will be ideal for me to improve and make something that can't be found in shops. I am going to make 5 pieces from vintage recreation patterns in 2015. So, I, Kate of Adventures of a Fashionista Geek, pledge to make at least 5 (but hopefully more) vintage reproduction pieces from patterns I already have. I, Krystle, am taking this pledge. I will try my best to use at least 5 of my many many patterns in number so my husband doesn't have to say to me any longer, "why don't you use the patterns you already have?" 5 patterns a month I meant to say and perhaps some of my accessory patterns as well!